So, one day before my first official FoW tournament and I'm still not done painting. I'm so close. I'll be done the 501st Schwere, no problem. But to gear up, I had a practice game with Sylvain. He said he would build an army as if he were going to a tournament. I had to use some proxies for this, but that was ok. I used Marder III's instead of Wespes. As he started pulling his Soviets out, I quickly realized he put together the worst possible army the KT's could face. 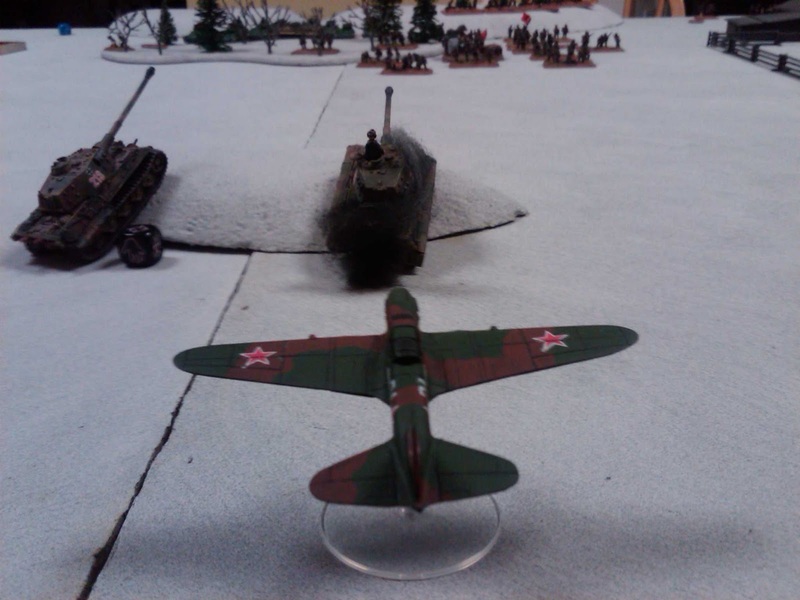 An Infantry Battalion with the God of War, and Priority Sturmoviks. Rolling for one of the 4 scenario's we will play in this tournament we came up with fighting withdrawal. So, again worst case scenario for the KT's as he had 2 SU-152's held in ambush. The first two turns quickly made my worst fears come true. The Sturmoviks killed 2 of the KT's including the Company Commander, and my Pioneers stayed pinned for 5 of the 8 turns. Not to mention my Wespe's couldn't range in if their life depended on it. Luckily for me things turned around. He started pulling companies off the board, he's planes started to miss, my pioneers became unpinned. There was one scary moment on the last KT where Soviet flame throwers tried to destroy it. But they failed their FP test. I was able to move in close enough to attempt an assault with my remaining Pioneers and set the last KT up to assault right after them. It literally was going to come down to the last turn. And on the last turn it all went my way. 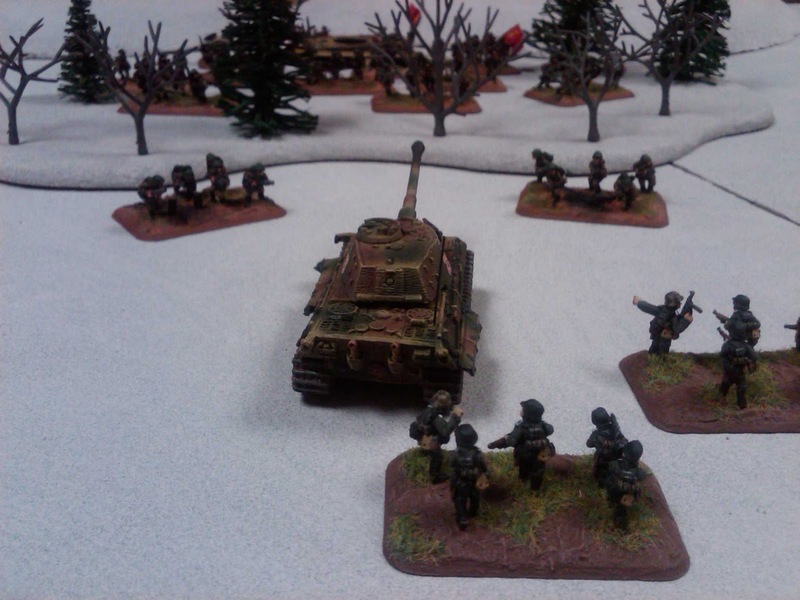 The Wespe's finally ranged in, and although they didn't kill anything they pinned down the last platoon. The Pioneers began their assault. We went through 3 turns of Assault. No one wanted to back off. 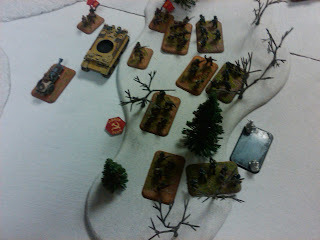 Luckily for me the Soviet Sappers rolled all 1's and 2's on every dice in every assault round. The German Pioneers wiped out the Soviet Sappers. The final KT that survived (the one my son bought me for Christmas) didn't need to Assault. I'm looking forward to tomorrow. Here is Sylvain's version of the story. I apologize the pic's aren't that great. I used my phone instead of my regular camera. Good luck in your tournament!